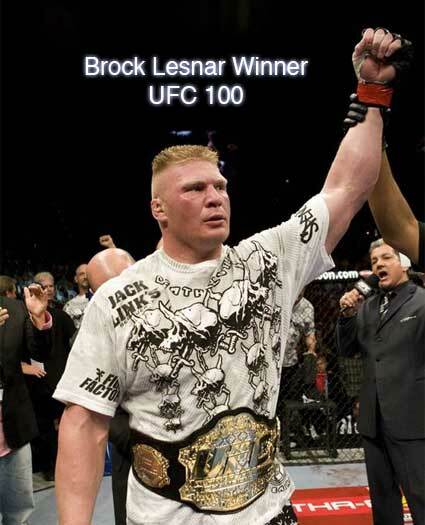 Brock Lesnar UFC 100 winner over Frank Mir in second round via TKO at 1:48 mark and stopped by referee. Mir received over a dozen swift blows to the face from Lesnar’s ground and pound routine. His pure size and force was unstoppable. One of the biggest and most anticipated events in Ultimate Fighting Championship history is the heavyweight fight between these two opponents. The quick match in the Octagon took place at Mandalay Bay Events Center in Las Vegas, Nevada to a completely packed house of 10,842 mixed martial arts fans.